Tennis elbow, when neglected, can develop into a chronic medical condition resulting in limited arm function and immobility. Tennis elbow therapy requires specific healing properties. The hhoose purely natural treatment without harmful chemicals. Salikort cream can bring sufficient relief from inflammation. Active herbal extracts soak deeply into the achy tennis elbow muscle and target the real pain source - inflammation. Additionally, Salikort can bring relief and help you rediscover the joy of pain-free movement. 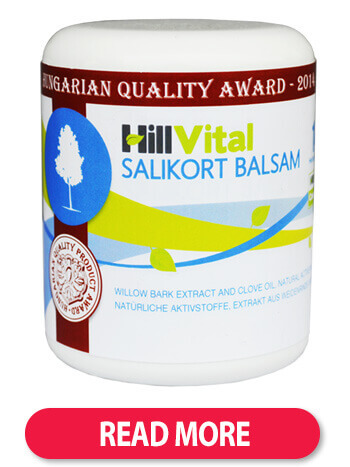 Salikort’s unique and protected formula consists of healing herbal extracts and essential oils that help relieve tennis elbow pain. The combination of Marigold and Lavender creates an anti-inflammatory powerhouse. Add Rosemary to the mixture and you will experience relief from swelling. Tennis elbow regeneration can be accelerated by drinking our herbal natural tea blend. 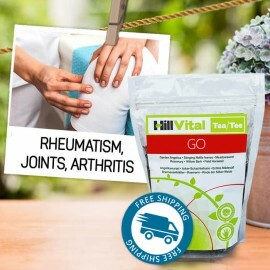 Tea Go contains a unique combination of natural herbs for problems with the musculoskeletal system. The herbs in Tea Go act from within and help start natural process of joint regeneration. Our vitamin pack, VITAGO, contains complex vitamins, minerals and healing herbal extracts that help provide sufficient nourishment and regeneration. Herbal pain relief to improve quality of life. 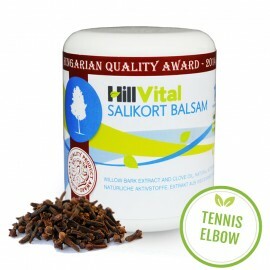 HillVital products for tennis elbow contain natural analgesic - Willow Bark, Comfrey and other effective herbal extracts to relieve pain, swelling, inflammation. Lateral epicondylitis, more commonly known as "tennis elbow", doesn’t only affect tennis players. You can experience it even if you had never played tennis in your life. It is caused by the overuse of your wrist, normally one one side. Tennis elbow is commonly referred to as writer’s cramp as it primarily affects professional writers. Tennis elbow can affect people regardless their age, gender or occupation. The trigger can be as simple as accidentally hitting something. Tennis elbow can be caused by excessive overuse of a computer mouse, frequent flicking through books, picking up phones, throwing a ball or lifting weights at the gym. Experiencing elbow pain doesn’t mean your are necessarily suffering from tennis elbow. It can be a sign of osteoarthrosis, a fracture, golf elbow or another disease. Tennis elbow can lead to pain and immobility of the elbow. Common signs can be an inability to hold objects, difficultly stretching the hand or writing with a pen. Tennis elbow can be recognized by symptoms such as experiencing pain when touching the elbow or when lifting things. You might not experience pain when at rest but physical exertion will bring it back. Tennis elbow can lead to elbow swelling, redness and fever. The basic rule of tennis elbow prevention is to not put so much strain on your arms when conducting everyday activities. You should frequently switch using your arms and not burden them with repeated motions. Strenuous repeated movement leads to overuse and can result in tennis elbow. Physical therapy can help to alleviate the symptoms of tennis elbow. Another form of treatment includes electrotherapy, laser treatment, magnetic therapy and bioptrone lamp treatment. Natural anti-inflammatory products are excellent for supporting the body's recovery. When using your hands during the recovery process, stretch your wrist muscles and tendons and gently put them to work.